Sheraton Grand Danang Resort, a stunning beachfront property with world-class facilities, recognizes the significance of giving back to local organizations through meetings and incentives. As corporate social responsibility (CSR) continues to be a meaningful and requested component for groups, Sheraton Grand Danang resort will organize programming with local organizations, and even plan immersive and engaging activities with these charities. Kianh Foundation address the desperate need for improved care and development for children with disability living around the Hoi An area of Central Viet Nam, while Operation Smile Vietnam repairs childhood facial deformities while building public and private partnerships that advocate for sustainable healthcare systems for children and families. Both incredible and touching organizations, these are two examples of many ways to give back by booking a meeting or event with Sheraton Grand Danang Resort. 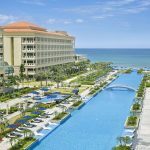 In addition to this new offer, The Sheraton Grand Danang resort also recently introduced The Celebrate Your Way Package, with a choice of three benefits: a complimentary one-hour drinks reception, one in ten attendees free, and double points (available from 1 October, 2018 to 31 May, 2019 for meetings held by 31 May, 2019); and The Meet & Be Rewarded with a choice of three benefits: a free one-hour welcome reception, five percent off master-billed rooms, or double points (valid for bookings made from 1 October, 2018 to 31 December, 2018, for meetings that take place by 31 December, 2019). With its blend of beachfront charm and world-class facilities, Danang has become one of Southeast Asia’s most dynamic destinations for meetings and events. Located just minutes from the airport, there are over 20 international flights to Danang, making it easily accessible for travelers all over the world. 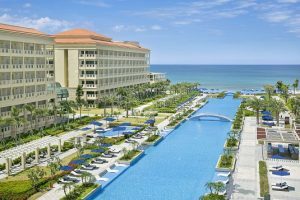 Sheraton Grand Danang Resort features more than 3,300 square meters of MICE space including exquisite alfresco venues and Danang’s largest hotel ballroom. The resort encompasses two 6-floor hotel blocks: a 130 hotel rooms and suites including the Ambassador Suite and the other 128 rooms and suites including the luxurious Presidential Suite with private lift and helipad access.